DART has selected the points where the D2 Subway will connect the existing system; one located south of Victory Station and the other at Swiss Avenue near Good Latimer. DART continues to evaluate and whittle away at choosing one of three connecting corridors between the Swiss and Victory points (Pacific, Elm, or Commerce). So how will DART evaluate the Pacific, Elm, or Commerce alternatives to choose just one? Great question! DART is seeking feedback through public meetings, pop-up riders surveys, and technical and stakeholder meetings. These options also continue to be evaluated based on multiple factors including; cost, design constraints, accessibility, potential property and traffic impacts, and transferability with bus and rail. 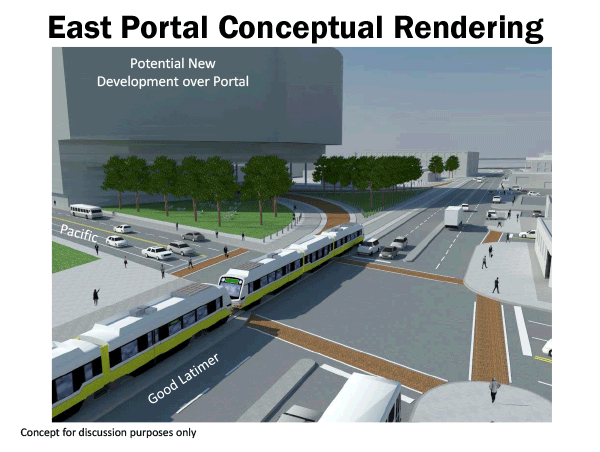 DART is moving forward creating concepts for elements of the alignment, including stations and portals. Subway stations are accessed by pedestrian portals. Ideas for where these station entrances could be and examples of what they might look like have been explored for Metro Center Station, Commerce Station, Elm Station, and CBD East stations. 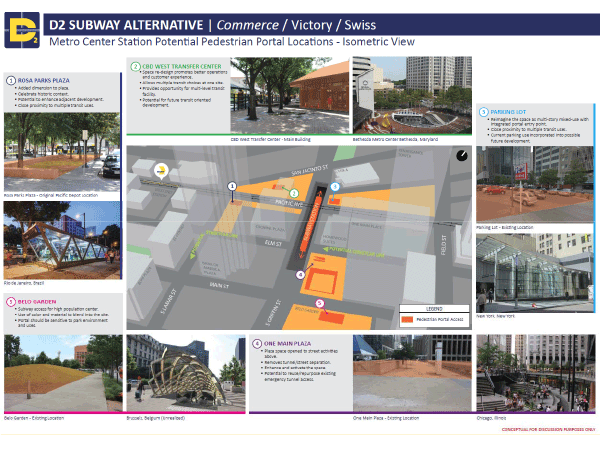 Below is a map of the Metro Center Station Concept for the Commerce/Victory/Swiss alignment. The D2 Subway will have two train portals, a north and an east portal. The first will transition from the Victory Park right-of-way headed underground near the Woodall Rodgers Freeway. The East portal will transition the D2 Subway underground to above-ground at IH 345 near Swiss Avenue and will reconnect to the Green Line. Opportunities for air rights to develop over the portals can help integrate them better into the fabric of downtown. DART will continue to seek input from the public and stakeholders on the LPA. While one alternative may be recommended, other alternatives may continue to be researched in case the first option has fatal flaws. Once an LPA is selected, we will take another two years to fine tune the project during preliminary engineering (PE) and identify potential impacts and mitigation in an Environmental Impact Statement (EIS). Public and stakeholder input becomes even more important during this phase before we hand off the project for final design and construction. If all goes as planned, we could see D2 operational by the end of 2024. Want to hear from our D2 team themselves? Check out our recent Facebook video about the D2 Subway. Our goal is to keep North Texas informed, and keep the D2 Subway process as transparent as possible. 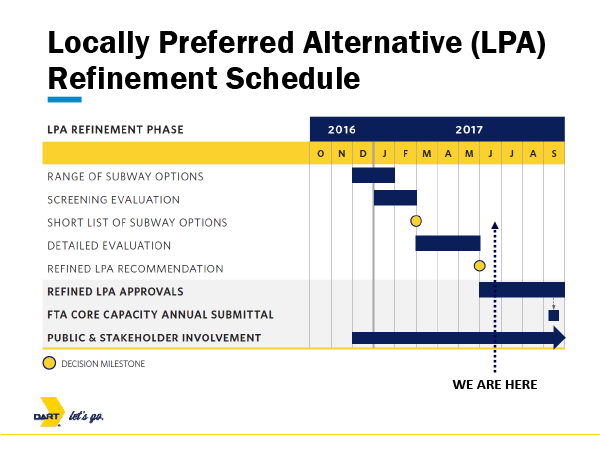 Stay tuned as we work towards submitting the LPA to the DART Board of Directors and the Dallas City Council for approval during August and September We’ll continue to update you so we can make the project a success for our entire region.